When it comes to meetings with executives and customers, it’s a lot easier to build trust—and therefore close a deal—when you can physically see the person you’re talking to. In fact, in a survey of IT professionals, 86% agreed that video conferencing accelerates decision making, according to Frost & Sullivan. 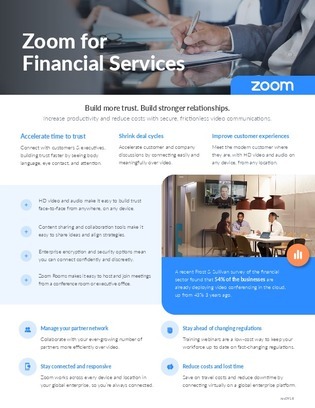 Learn about Zoom Video Communications in this case study, and find out how it can help increase productivity and reduce costs through secure video communications.